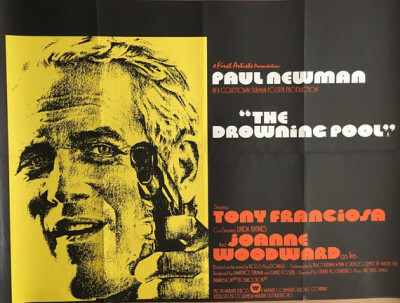 A sequel, barely, to Harper (1966), The Drowning Pool (1975) has star Paul Newman revisiting his Lew Harper private eye character for the second and last time, nine years after his earlier neo-noir hit. The Drowning Pool was neither as successful nor as influential as its predecessor, and critics generally found it inferior, Roger Ebert for one, opined that it was too classy a production for such B-movie grade material. I disagree. Seen back-to-back, The Drowning Pool is less affectacious, less self-conscious, more assured, realistic and subtle. When it was new, Harper was novel and hip, where by the time Newman revisited the character in The Drowning Pool he was competing in a crowded field, with everyone from Elliott Gould to Robert Mitchum in similar pictures. But the quality of the material is essentially the same, and in many respects The Drowning Pool does it better, including Newman's own performance. Adapted from Ross Macdonald's 1950 novel, the second to feature the character (called Lew Archer in the books), the story has Harper (Newman) flying to New Orleans, and like the opening titles to Harper there's some innocuous under-the-opening-titles comedy, with Harper struggling with an airport rental car's defective seat belt. He's there at the request of Iris Devereaux (Newman's actress-wife, Joanne Woodward), an old flame now married into a moneyed family of former slave owners living in a palatial southern gothic mansion. Distressed and hitting the bottle, she produces an intercepted, typewritten letter addressed to her husband (Richard Derr) informing him about her sexual dalliances. She suspects the recently fired chauffeur, Reavis (Andy Robinson, the psychopath in Dirty Harry). Harper, however, quickly realizes that there's a lot more going on than meets the eye, especially when she introduces him to her 17-year-old daughter, Schuyler (Melanie Griffith), who not-coincidentally broke into his motel room and propositioned him hours before. That incident leads to an awkward detainment by parish police Chief Broussard (Anthony Franciosa) and bad-to-the-bone Lt. Franks (Richard Jaeckel). Harper is soon released uncharged, but it's clear the two cops have strong if differing interests in the Devereaux family and Harper's investigation. Harper is then taken at gunpoint before J.J. Kilbourne (Murray Hamilton), a good ol' boy oil tycoon who wants Harper's cooperation in digging dirt on the Devereauxs for want of their oil-rich land. Or else. It no doubt helped, too, that Newman was acting alongside frequent co-star Woodward and others with whom he had fruitfully done films with before. Richard Jaeckel, playing a particularly mean and crooked cop, had done his finest acting work ever opposite Newman in Sometimes a Great Notion, and Hamilton and Franciosa had extensive stage careers before entering films, like the Newmans. Director Stuart Rosenberg had worked with Newman three times previously, including Cool Hand Luke (1967), their biggest success. The script is credited to three disparately talented writers, Tracy Keenan Wynn, Lorenzo Semple, Jr., and Walter Hill, working independently and consecutively. Hill later stated very little of Macdonald's book made it into at least his version, but the adaptation captures the original author's spirit, and Macdonald seemed at least moderately pleased, insofar as he's interviewed for the featurette accompanying the disc. Gordon Willis was a good choice to photograph The Drowning Pool, in Panavision has Harper had been shot (by Conrad Hall). Willis and Hall have slightly different approaches to the material, but they compliment rather than conflict with one another. The score by Michael Small is also good, making judicous use of local Louisiana Bayou sounds as well as instrumental arrangements (but not the vocals) of the 1973 hit "Killing Me Softly with His Song," a cue thematically tied to Woodward's character. That song was co-written by Charles Fox, one of many odd coincidental connections to, of all things, Japanese monster movies. Fox wrote some of the music (for the U.S. version) to The Green Slime (1968), which starred Richard Jaeckel. Jaeckel also appeared in another goofy Japanese sci-fi outing, Latitude Zero (1969), which featured pretty Linda Haynes. Haynes has a prominent role in The Drowning Pool as the chauffeur's prostitute girlfriend, sharing several long scenes with Newman. Jaeckel, presumably was cast at Newman's recommendation after the former's fine work in Sometimes a Great Notion, but did Jaeckel recommend Haynes based on their months in Japan together toiling on Latitude Zero? The title refers to the movie's major set piece, filmed in the big water tank at Warner Bros. in Burbank, but seamlessly integrated into the picture, nearly all of which was shot on location. Harper and Kilbourne's terrified trophy wife (Gail Strickland) are trapped in a long-closed bathhouse in an asylum, and to escape deliberately flood the watertight room hoping to escape through a skylight above. Genuinely tense, it's a preamble to the film's last act, very grim but appropriately so. Filmed in anamorphic Panavision, Warner Archive's Blu-ray of The Drowning Pool looks as impressive as their concurrent release of Harper, the image razor sharp with strong blacks and solid color. The DTS-HD Master Audio mono also benefits from the format. Optional English subtitles are included. Supplements are limited to a recycled featurette, "Harper Days Are Here Again," the kind of thing that used to run after primetime network airings of movies that ran too short or long for their time slots, allowing for short promo films such as these. It's nothing much, but does show the actors at several locations, and includes an interview with Ross Macdonald. A trailer rounds out the extras. A cut above the usual ‘70s detective thriller, The Drowning Pool is Highly Recommended.